I found a chair for sale and because it matched one already in my house, I sent a message to the owner and asked to buy it. That was fine. It would be held for me, all I had to do was come around and pick it up. The chair would cost me sixty dollars. That’s fine. I travelled into town and went to where the lady lived. A semi rural area where the houses are set apart on wide blocks and a lot of open space around. I went to the front door. The verandah was fenced off and there were a dozen small dogs hysterically throwing themselves about and barking. I stood on the front steps ten feet away from the front door so I could not knock, but the dogs were making enough noise the neighbors came out and gave me strange looks. Finally the lady who owned the house came out and she was very friendly. A very kind woman, very welcoming and warm, she knew I was there to collect the chair. She told me to come in and the dogs would not bite me. I opened the gate and came in suddenly a three legged dog lunged toward me and locked its jaws around my shin bone. Its teeth sunk into my skin and it held on. I stood there in shock, automatically I wanted to kick the dog and send it hurtling off the verandah but I did not want to hurt it (not in front of the woman anyway). She yelled at the dog and then whacked it on the head and it released me, looked guilty for a moment and then came back to bite me again but I managed to get inside the house and escape. She brought out the chair and I paid for it. 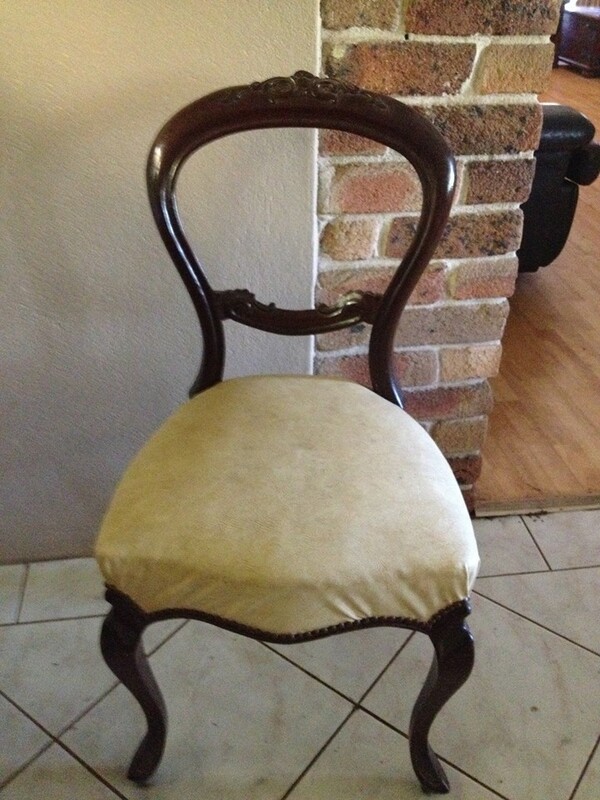 It is a beautiful chair and in very good condition and I told her so. She was pleased to hear this and then she showed me some other antiques she owned, each of them being of high quality. Then we came to a brand new sideboard. It had lead light windows in the front doors but one of the panels was cracked. “Oh so you are handy then?” I asked. Silence. She went quiet and I went red in the face. She was embarrassed and I was embarrassed so I left with my chair at that point. As I left even the dogs did not come near me. But I did buy a nice chair.